Feeling depressed and low? This guy at Costa Coffee taught me something invaluable about being at peace! At Costa Coffee outlet at DLF Mall in Noida today, I hovered blankly over an iced latte. I wasn't in my best mood. You know how it is, there are days when one feels disappointed and let down by the self and withdraw into an inner shell. And so it happens that the server at Costa Coffee who brought to our table what we had ordered is a smiling young man. He has a big, happy smile on his face. We looked up. He was conveying something with his fingers to my son, who had his headphones switched on and was listening to music. I looked up and understood then that the young man was deaf and unable to speak, which is why he was using sign language to communicate. This is what I think he communicated to my son, ''Enjoy your sandwich.You have a good smile and a good day. Thank you for coming today, happy to serve you." I watched their exchange with rapt attention. I had a different view and I told my son, '' I feel bad for him too but the point is that he is happy with himself. Didn't you see how he smiled? Does he look like someone who feels awful about himself? In fact, he is creating happy energy with his smile for his customers, right? He is more cheerful than others because he chooses to be, he makes his weakness his strength, he is at peace with what we say is his 'weakness'. " This guy had just taught me an invaluable lesson! Maybe that's the whole idea of life, being called a divine play. He may have been born without the ability to hear or speak but just look at how he has chosen to play his role. With a big smile, with happy energy. And now look at us, we have eyes, ears, everything and more - but do we always choose loving, peaceful words to ourselves or people around us? Often our choices are steeped in the need to accumulate more, get more, take more, grab more, etc. In a sense, he is luckier than us. Whatever he is trying to convey without the ability of speaking, he still chooses to spread happy vibes, happy actions. What about us? Well, we are in forever cribbing mode, aren't we? 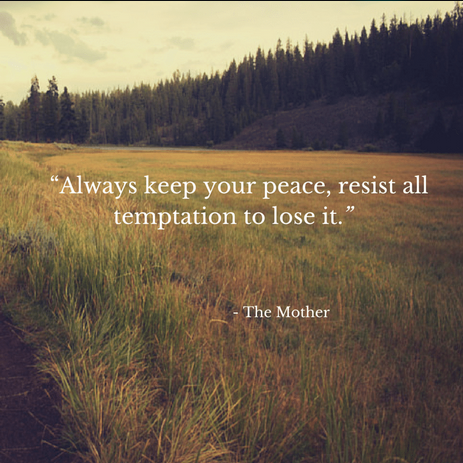 It reminds me of a lovely quote by The Mother, ''Always keep your peace, resist all temptation to lose it." Have you ever felt this way at unexpected moments in your life? Hi Mohan, everyone fights their inner battles...the best thing to do is never ever give up on yourself or the battles that you are fighting because every experience in life makes us stronger and wiser. We just need to see the bigger narrative. Have faith. Stay strong.